Deployment test of the first completed CYGNSS microsatellite, February 4, 2016, at the Southwest Research Institute. February 15, 2016 – NASA’s Cyclone Global Navigation Satellite System (CYGNSS) mission has reached a new milestone in its goal of improving hurricane forecasts. 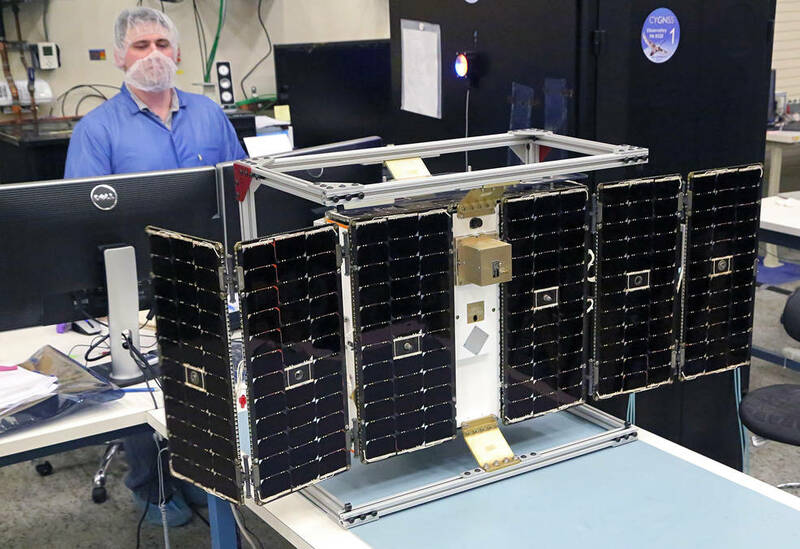 Southwest Research Institute has finished assembling one of the eight microsatellites for the constellation at its facility in San Antonio, Texas. Assembly of the microsatellites began in August 2015. The body of each satellite measures roughly 20×25×11 inches (51x64x28 centimeters), slightly larger than a standard carry-on suitcase. When fully assembled, the satellites will each weigh about 64 pounds (29 kilograms). With its solar panels deployed, each microsatellite will have a wingspan of 5.5 feet (1.67 meters). The eight microsatellites will be completed this spring, and from there they will undergo environmental testing and calibration and validation. Once all eight microsatellites are assembled, the CYGNSS mission is scheduled to launch in October 2016 and will be the first mission to probe the inner core of hurricanes in greater detail to better understand their rapid intensification. The constellation of eight microsatellites will measure surface winds in and near the inner core of hurricanes, including regions beneath the eye wall and intense inner rainbands that could not previously be measured from space. The CYGNSS-measured wind ﬁelds, when combined with precipitation ﬁelds (e.g., produced by the Global Precipitation Measurement core satellite and its constellation of precipitation imagers), will provide coupled observations of moist atmospheric thermodynamics and ocean surface response, enabling new insights into hurricane inner core dynamics and energetics. CYGNSS will launch from Cape Canaveral Air Force Station in Florida aboard a Pegasus XL rocket from an Orbital ATK Stargazer L-1011 aircraft. CYGNSS is funded through NASA’s Earth Science Division through its Earth System Science Pathfinder Program Office and developed by the University of Michigan. The Southwest Research Institute in San Antonio is building and testing the CYGNSS microsatellites and will host the mission operations center at its Boulder, Colorado location.